Crystals are spent on upgrading your tank, whether this be new paints, turrets, hulls, or Micro Upgrading any of the three aforementioned. For example, you need 100 000 crystals to buy the "Python" paint. After you confirm the purchase, you will be charged the amount of required crystals and the selected item will appear in your Garage. From gold boxes that are randomly dropped on the battlefield. Crystals are distributed depending on the number of tanks destroyed and points earned during the battle. 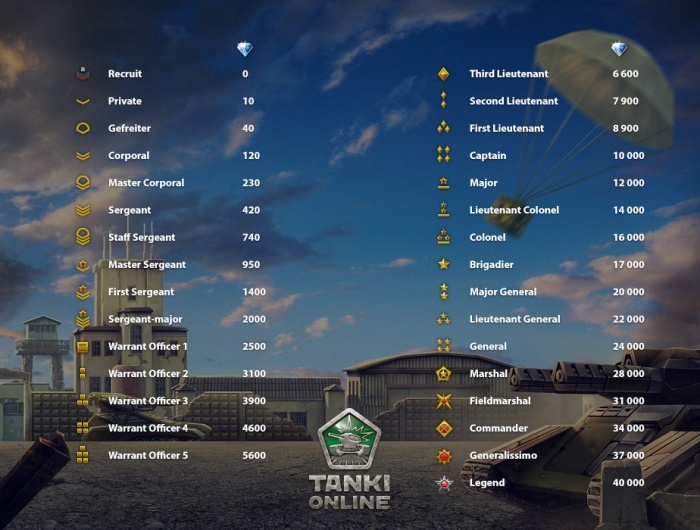 Daily missions are three optional tasks that every tanker receives upon entering the game. The reward for completing one of these aforementioned tasks is dependent on both your rank, and the difficulty of the task. Daily missions are not reset with scheduled server restarts. This means you can take as long as you need to perform a specific mission — an hour, a day, a week, or more. Though while they are not reset, they are refreshed. This means that after the server restart, when you next log in, you will find a full stock of three daily missions awaiting completion. So if you only had time to finish two missions the day before, the incomplete mission will remain, and two new missions will have appeared next to it. If for some reason you don’t like a mission, or find it too hard to complete, you can exchange it for a task of a different type. You can do this once a day for free, and any number of times after that for a specific amount of crystals. The cost in crystals will depend on your rank. Referrals are players who you invite into the game via a link or banner. You get crystals when your referrals rank up. Also, you get 10% of the amount of crystals they buy in the game (double crystal cards are not included). The Administration regularly organizes contests which you can take part in and win prizes. Follow the news! You can buy crystals by clicking on a button at the top of your screen in the Lobby. Następny artykuł: How to report a violator?